Anna Shurakova by summer. Warm scene of rural life. My name is Anna Shurakova and I am from the old Russian town Rybinsk. Painting is my real passion and joy of life. I love nature in all its manifestations. 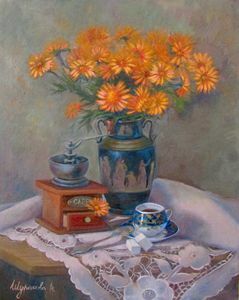 My main subjects for paintings are still life and landscapes. I am a regular participant of exhibitions in Russia and also I am involved in many various art projects. I realize the main purpose of my work is revival of Russian culture by the returning to the ethnic traditions and expanding the horizons of my own life. I would be very happy if you will love my work which I am creating from the bottom of my heart. Still life with blue cup. The path in the woods.